Hand-blown by Kimberly McKinnis, it’s a sweet way to serve summer cocktails. Sipping sangria with a summer read in hand. Toasting to sunshine with a round of frozen daiquiris. 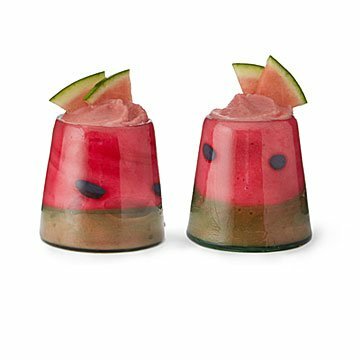 Warm-weather drinks are even more fun when they're served up in Kimberly McKinnis' hand-blown tumblers. Kimberly adds a band of green "rind" and dark spots that resemble seeds to every bright pink glass. To make the tumblers extra delightful, each is wide at the bottom and tapers in, like a wedge of the scrumptious fruit. Give one to someone who makes a mean melon mojito, or get a few for your next backyard brunch. (Watermelon mimosas, anyone?) Handmade in Norfolk, Virginia. Before co-founding a handmade collective for artists, Kimberly McKinnis earned a BFA in studio art with a concentration in glass and an MFA in exhibition design, both from California State University. Now, she lives in Norfolk, Virginia, where she makes art with her collective co-founders and works as an adjunct faculty member at Old Dominion University and The Governor’s School for the Arts. She’s also part of the glass studio team at the Chrysler Museum of Art. 2.5-2.75” x 2.5-2.75” x 3.74-4” Holds about 12 liquid ounces.